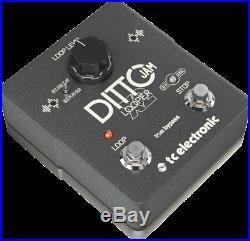 TC Electronic Ditto Jam X2 Looper Guitar Effects Pedal. Intuitive looper pedal with first ever intelligent loop synchronization that responds to your band. Innovative responsive BeatSense technology automatically adjusts loop tracks to your beat. Choose between Record-then-Play or Record-then-Overdub functionalities. Unlimited overdubs and undo/redo for total creative freedom. Dual built-in mics accurately track band tempo by focusing only on rhythmic elements. Included clip-on mic attaches to percussion instruments for total rhythmic precision. Dedicated stop button for easy control of loop endings. Analog-Dry-Through maintains total integrity of analog dry signal path even when looper is engaged. 24-bit uncompressed audio for ultimate sound quality. True bypass allows for optimum clarity and zero high-end loss when the pedal is off. Sturdy die-cast metal case designed for life on the road. Designed and engineered in Denmark. The revolutionary DITTO JAM X2 LOOPER features our cutting edge proprietary BeatSense technology, making it the first looper pedal ever to automatically keep your loops and backing tracks from drifting out of sync. And with a dedicated Stop footswitch, unlimited overdubs, no-nonsense one-knob design and road-proof DITTO build-quality, youve got a jam buddy that always has your back even in the most intense live situations! For the first time ever, you can loop with your band in real-time without having to sync with a MIDI clock, letting you make it up as you go, without drifting out of rhythm. Its like having an invisible band member onstage with psychic powers. Built-in microphones and an included clip-on mic allows DITTO JAM X2 to listen to its surroundings, separate background noise from the rhythmic elements of your band and sync up. Our state-of-the-art algorithm is able to stretch or compress your loop dynamically to your tempo while still maintaining audio quality. This means your DITTO JAM X2 automatically stretches the loop by a couple of milliseconds to make it fit the pocket so your performance is always nice and tight. DITTO JAM X2 provides the perfect practice platform for getting those extra tricky intricacies locked down with the revolutionary ability to record a loop and speed it up or slow it down using tap tempo. Simply lay down a solid loop and gradually increase the tempo as your skills progress or take it way down and practice filling out the pocket until its bursting at the seams! Of course, DITTO JAM X2 LOOPER also features a classic looper mode like the one you know and love from the rest of the DITTO series for when youre in the mood for some old school looping. A toggle switch lets you jump between recording, playing your loop back, or recording the loop and going straight to filling out the sonic space with your sweet overdubs. This gives you total control over how you want to create your loops, so you can unleash that Magnum (Lo)opus masterpiece thats been simmering in the back of your mind! The simple layout is streamlined to remove clutter, ensuring that nothing gets in the way of your musical inspiration. Dedicated footswitches for looping and stopping make it easy to keep your grooves tighter than an'80s spandex suit. With its ability to lock onto the beat of your drummer or bass player, DITTO JAM X2 is the ideal solution for live looping with a band. The ultra-simple design and guitar-centric features such as: True Bypass; Analog Dry-Through; highest signal integrity; and unlimited overdubbing has won over the hearts of guitarists all over the world. DITTO JAM X2 elevates your playing to the next level, locking your loops with the band's timing for a performance that is ultra-tight and sublimely organic. 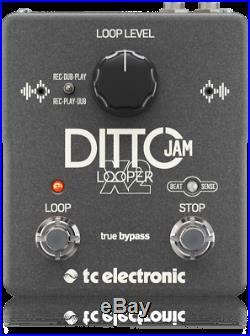 DITTO JAM X2 LOOPER even lets you export loops to the DAW of your choice, or import your favorite loops and backing tracks straight to the pedal and take them with you to the gig. Small sentence, HUGE advantage for gigging musicians! 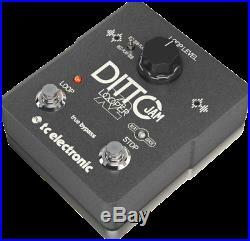 The item "TC Electronic Ditto Jam X2 Looper Guitar Loop Effects Pedal" is in sale since Monday, August 20, 2018. This item is in the category "Musical Instruments & Gear\Guitars & Basses\Parts & Accessories\Effects Pedals\Loopers & Samplers". The seller is "citymusicsteve" and is located in Leominster, Massachusetts. This item can be shipped worldwide.